In Profile of a Learner (Part 1), you experienced our redesign of the CCOL Profile. One update shows the achievements each learner completed and highlights in-progress activities for them to continue their aspirations. Another change allows the learner to save their interests to the CCOL Profile. Now fast forward three months, and the tech team has iterated and strengthened the learner’s experience based on those selected interests. Digital Youth Network has always maintained a strong product feedback with our users. Mentors, teachers, and students have helped shaped all of our products including iRemix and Chicago City of Learning. We invested some valuable time to understand how learners were using their new profile, and whether it matched up with our pre-launch research. Our assessments came in the form of tools like CrazyEgg and old fashioned f2f user observations. The primary outcome was quite positive with many learners successfully self registering to any of our programs and exploring thousands of activities. However, the question of ‘What now?’ or ‘What do I do next?’ did arise several times. As a complimentary tool to our observation, we employed Crazy Egg. This UX tool allows us to see a heat map of what learners were doing when they returned to this page. Many of our call to actions were taken as expected. Learners updated their interests, continued their in-progress online challenges, and registered themselves to activities and badges. Per CrazyEgg’s site: Crazy Egg is like a pair of x-ray glasses that lets you see exactly what people are doing on your website. One area stood out: our learners hovered over their interests…quite often. We did not design the interests themselves to be interactive. But the evidence presented on the heat map combined with the user research feedback suggested an opportunity for a focused call to action. The action was to make the interest icons interactive by presenting 3 activities as options for what to do next. 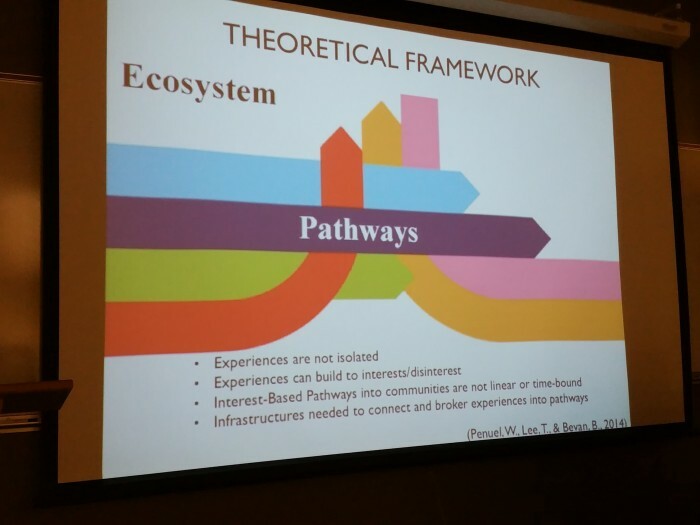 How did we convert research into “impactful value” for our Learners? 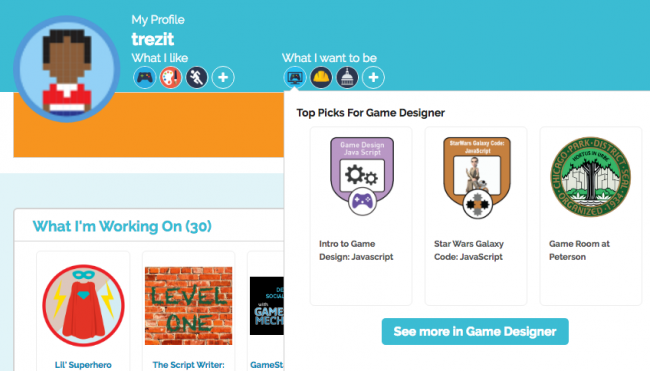 In the screenshot below, the application presents three Top Picks based on the learner’s Game Designer interest. These picks will be a mixture of face to face and online activities. With this enhancement, the CCOL Profile allows learners to dive into activities based on the interest they want to pursue right now. This engagement-based update creates a valuable feedback loop that encourages learners to update their interests when their interest in subjects or professions shift. And because those can change as often as their avatars, CCOL can present new and challenging activities for our Learners to explore. One of our annual goals is to increase access to opportunities and experiences through technology. Chicago City of Learning does it. iRemix does it. And since 2014, our aptly named Broadening Participation initiative does it. Ugochi Acholonu leads this research initiative, and recently she presented a summary of programmatic efforts in 2015. Here’s a brief look at some of the presentation. Next up was Hour of Code that DYN hosted at DePaul University. The number of participates and potentially increased interest in coding and designing was substantial. – 412 Badges earned to represent their learning experience. Finally connecting Minecraft to deeper connected learning. While kids are building and designing, they are reaching achievements. The BP team has designed some achievements to translate into badges to mark important skill accomplishments. 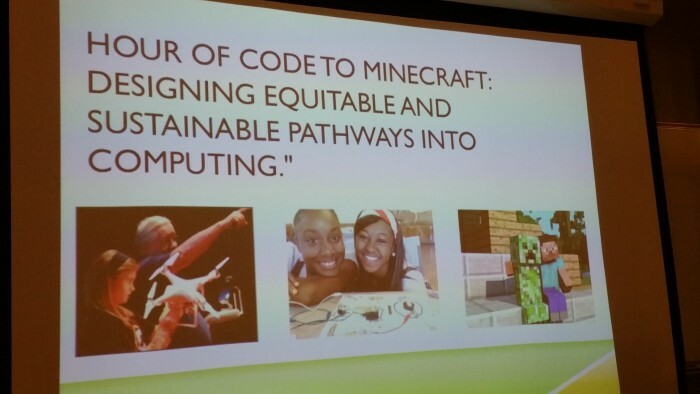 Using an existing framework like Minecraft to add custom achievements and badges is our next step for connecting outside of school activities to highlight their interests and skill sets inside of school. In 2016 badges earned in our Minecraft universe will get pushed to Chicago City of Learning. This will allows students to see their programs and skills learned and to share those accomplishments with mentors, parents, teachers and employers.